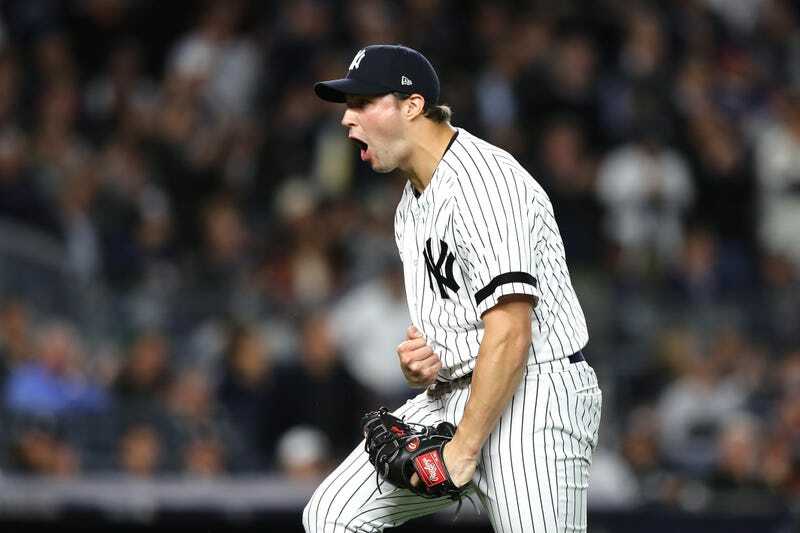 No team plans on their starter getting knocked out after just one out in a deciding playoff game, but no team is as prepared for the possibility as the Yankees, who showed off their considerable strengths in a wild, interminable 8-4 win over the Twins to advance to the ALDS. Luis Severino looked shell-shocked in his playoff debut, giving up three runs and four hits in a third of an inning, just the 17th starter in the history of baseball to get one or zero outs in a postseason game. That’s usually as certain a death sentence as you’d expect: Of the previous 16 early exits, just one starter’s team came back to win the game, and that was 92 years ago. But what’s a three-run head start, really? These Yankees have the power to make up that deficit quickly, and just as importantly, a bullpen that’s deep enough and talented enough to stop the bleeding right there? Did I say no team plans on taking out a starter that early? The Yankees had specific plans, though in a burst of optimism, that contingency was based on Severino getting hurt rather than getting shelled. And so it was Chad Green, boasting the best ERA of any of the Yankees’ vaunted relievers, who escaped a second-and-third, one-out jam to clean up Severino’s mess. And then a career-high 3 1/3 from David Robertson. Then 2 1/3 perfect innings from Tommy Kahnle, who came over from Chicago along with Robertson in what might prove to be the season’s most impactful trade. Then a scoreless ninth from Aroldis Chapman. In all, the Yankees’ bullpen got 26 outs while giving up five hits and one run, and striking out 13 Twins. There’s the rub. For as overwhelming a display of force as the Yankee pen showed last night, it left bullets in the chamber. The Yankees did not use Adam Warren, a former starter who can probably provide more length than any other single reliever, and who sports a 2.35 ERA this season. They did not use Dellin Betances, who struggled a bit to close the season but was until very recently a closer and who wields a 100mph fastball and the best K/9 rate on the team. The one place the Yankees clearly lag behind some other postseason teams is in the rotation. Severino aside, Masahiro Tanaka, Sonny Gray, and CC Sabathia can all be effective, but they can all fall apart very quickly. Joe Girardi hasn’t hesitated to yank his starters at the first sign of trouble, and that’s only going to be magnified in the playoffs. He does it because he can, because he believes, and has generally been proven correct in believing, that his bullpen can take over a game in a way and for a length that no other roster can match. And his young lineup has the ability to close just about any deficit—six of the Yankees’ eight runs came on home runs, and all of them within the first four innings. A game like last night’s isn’t going to happen again, not exactly. There will be short starts, but presumably not that short. There will be shutdown pen performances, but nothing so complete or so multi-armed as that. But consider last night an exaggerated example of what these Yankees can be at their best after things get their worst. The Indians hit better, pitch better, are better than the Twins, and are heavily favored to win the five-game series. But few things go precisely as expected in the playoffs. And the Yankees have the best plan for when the plan falls apart.